Ahhh sugar, it comes in many forms. From high fructose corn syrup (aka corn sugar) to table sugar to evaporated cane juice, when you eat too much sugar it’s hard on the body. Just look at the number of people that have diabetes in America, about 26 million according to the 2011 Diabetes Fact sheet (go to www.diabetes.org for more info). Furthermore, there are 79 million people that have pre-diabetes which means that they have a high risk of developing diabetes. These are scary numbers that are projected to go up in the future and can be linked to diets high in sugar. High sugar consumption can also be linked to high blood pressure. Similar to excess sodium, when too much sugar is consumed it stays in the blood which thickens it and makes the heart work harder. Consuming too much sugar is hard on the liver, and can contribute to high cholesterol. This is because sugar is easily converted to fat, which can raise cholesterol levels. Lastly, when you overload on sugar it blunts the effects of insulin which is the body’s main regulator of metabolism. This is called insulin resistance. When your body is resistant to the effects of insulin even more sugar stays in the blood. Insulin’s main function is to remove sugar from the blood and shuttle it to cells to be used for energy, stored as glycogen or fat. So….if you consume too much sugar it stays in the blood, as discussed. Then, if you’re consistently consuming too much sugar, the body becomes more resistant to insulin’s effects and even more sugar stays in the blood. Not good! Is it starting to make sense why there are 26 million people with diabetes, and 79 million people that are at risk for diabetes? Added sugars in various foods, drinks, and products are the main problem. Added sugar has no nutritional value other than adding calories. Added sugar is the ultimate form of empty calories. Public enemy #1 is soda pop. A 12 ounce can of soda has 39 grams of added sugar! This is more added sugar than you should consume in a day! The American Heart Association states: “soft drinks and other sugar-sweetened beverages are the number one source of added sugars in the American Diet”. Rachel K. Johnson, Ph.D., M.P.H., R.D., associate provost and professor of nutrition at the University of Vermont in Burlington states: “High intake of added sugars, as opposed to naturally occurring sugars, is implicated in the rise in obesity. It’s also associated with increased risks for high blood pressure, high triglyceride levels, other risk factors for heart disease, stroke, and inflammation (a marker for heart disease)”. Hopefully I’m getting through to you and you realize the importance of cutting out added sugars. So how much is too much? First, don’t worry about naturally occurring sugars in fruits, vegetables, and dairy (however be careful with fruit juices because they can be high in calories and are low in fiber). According to the American Heart Association you should limit added sugars to no more than 25 grams, or 100 calories per day for women, and 37 grams, or 150 calories per day for men. That’s really not much when you think about it, only 5-6 grams of added sugar per meal. The only way it’s ok for your health to consume more sugar is if you’re active. When you workout the body relies primarily on sugar/carbs for energy. There you have it, Unhealthy S #2-sugar. Sodium is not bad for you in and of itself. Actually, your body needs sodium, and if you attempted to eat a sodium free diet you’d be in for a rude awakening. The problem isn’t consuming sodium, the problem is consuming too much sodium. According to the 2010 Dietary Guidelines for Americans (DGA), greater than 85% of Americans consume more than 2300 mg of sodium per day. 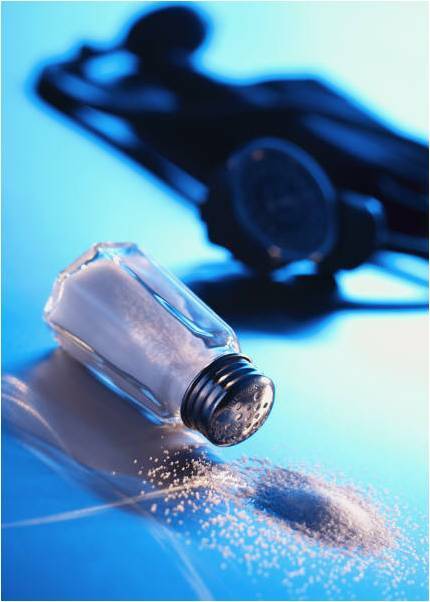 Dr. Pi-Sunyer states: Americans today are eating an average of 3400 mg of sodium a day (http://www.medscape.com/viewarticle/737118). Sodium is essential to life, it helps balance the amount of fluids in your body, is an important component in muscle contractions, and helps the body transmit nerve impulses. Unfortunately most Americans consume way too much sodium (the AVERAGE is 3400 mg per day which is over 1000 mg more . When too much sodium is ingested the kidneys (which attempt to balance sodium levels) can’t eliminate the excess sodium and it begins to accumulate in the blood. Your kidney’s work overtime whenever you ingest too much sodium. Also, sodium is hydrophilic meaning it attracts water. When there is too much sodium in the blood it attracts water which increases blood volume and causes the heart to work harder to move the extra volume of blood. This is one reason why too much sodium in the diet can lead to high blood pressure. More blood = more pressure on the blood vessels. The vast majority of Americans consume way too much sodium. This can usually be attributed to restaurants and processed foods that can be unbelievably high in sodium. Body Balance Healthy Living recommends 1500 to 2000 mg or less per day. A good rule of thumb is to consume 200-400 mg of sodium per meal. If you have high blood pressure, kidney problems, are diabetic, or if you’re over 40 you should keep sodium levels at the low end of the spectrum (1500 mg or less, 200 mg or less per meal). Be sure to read nutritional labels to weed out foods that are very high in sodium such as processed foods, many meats (especially luncheon meats and sausages), soups, some cheeses, and most restaurant foods (google the restaurant for nutritional info). It is hard on your body when you consume too much sodium. It increases blood pressure and makes the kidney’s work overtime. This happens time and time again, everyday, and after every meal that is high in sodium. For your long term health, you need to get your sodium consumption under control. If you don’t your staring directly at a heart attack or kidney problems. If you would like to learn more, please e-mail: ian@bodybalancehealthyliving.com, we want to help YOU lead a healthier lifestyle. It’s true, you are what you eat. If you eat garbage, you’ll feel like garbage. If you eat tons of saturated fat, sugar, and calories, you’ll get fat. Unfortunately, here in America, it’s really tough to eat healthy. There are temptations everywhere, furthermore, you’re constantly advertised to. More, more, more, bigger servings, buffets, cheap unhealthy convenient food is everywhere! It’s no wonder about 2/3 of Americans are overweight. The food environment is undoubtedly unhealthy. Sadly, it’s hard (and sometimes even expensive) to eat healthy. But that’s just the tip of the iceberg, not only are there cheap unhealthy choices EVERYWHERE, but it’s pack full of stuff your body needs. Let me explain. The food industry does billions of dollars of research to find out what the human body needs, and desires. Always remember, the food industry is profiting off of the obesity epidemic, there is no arguing this. The more you eat, the more they make, and they do everything in their power to get YOU to eat more. So here’s the reality. The food industry knows that your body craves and needs 3 things. #1-your body craves sugar, #2-your body craves sodium, and #3-you body craves fat. Because of this the food industry packs our foods full of the unhealthy S’s: Sugar, Sodium, and Saturated Fat. My next few blog posts will cover these subjects, and other ways that the food industry gets you to eat more. I’ll cover each of the unhealthy S’s, why your body craves them, and the health effects of consuming too much of these substances. Lastly, I’ll cover some of the other additives and preservatives that are put into our foods and why you want to avoid them. In closing, the only realistic way to avoid all of this crap that is put into your and your children’s food is to read labels and not buy products that have all of this stuff in them. If you’d like to learn more, stay tuned, or send me a e-mail at ian@bodybalancehealthyliving.com.